Sure, shoot me a message. Todays project, valve stem seals. The heads were rebuilt about 35k miles ago, but that was in the early 80's when my dad owned the coach. But I found evidence of severe oil leakage down the valve guides the other day when I had the intake off. So today, they are being done. Yes, they were junk. exhaust sides were in pieces. The intakes, so far, are intact, but hard as a rock and fall right off the valve stem. It is nice to see that there is no carbon residue in the valley or in the heads. I took a break for lunch. I have 5/8 done. Hope this cures much of my oil burn. I have been doing a leak down test on each cylinder and so far they have been between 14-16%, so there is nothing wrong with this motor. The motor is very cold (30 degrees F), so a warm motor would have even less leak down. Valve stem seals are done. Found a good set of aluminum valve covers on CL here locally for $60, so hopefully that will help with the normal 440 valve cover gasket leaks. She all went together smoothly and fired right up. Man, I love fuel injection. I am trying to take care of some of my smaller projects before I bring it into the shop in January for the transmission swap. Nice and clean engine bay, for the most part. What do you have for fuel injection? Also, where'd you get the air intake and filter in the picture? The fuel injection is a Professional Products Powerjection III. 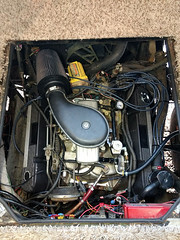 The air filter assembly is from a V8 Jeep out of the junk yard mated to a K&N cone filter. Cool. I'll have to look for one of those air filter tops the next time I go out to the pick and pull. Eventually, I'd like to setup a ducted system, but that'd work until I could. I had never heard of the Powerjection products before. I'm trying to decide right now between a Holley Sniper kit or a just save my money for an engine swap. What has your experience with the Powerjection been like? I noticed that Professional Products is no longer making the system. That is my bad. I should have bought a Holly or Edelbrock system which stood a better chance of being in business much longer. But, the system is working well, so until it fails, I will run with it. I love it. Never would I go back to a carb. And when I bought this kit it was $2k. You can buy newer systems for around $1k now. If you drive your rig at all, I would ditch the carb and make the switch. Power improved, but not by much. Economy improved, but not enough to pay for it for quite a while. The biggest difference is that it just runs perfect, everywhere. Does not care what altitude I am at, what the temperature is, how much humidity is in the air, or where I bought fuel at the last stop. Turn the key and it fires and goes. No hiccups, no vapor lock, no flat spots, no fuel smells, and the engine is noticeably smoother. No wondering if your jetting is right. No fiddling with air fuel screws, power valves, or cleaning out the carb because you forgot to put in fuel stabilizer and now a jet is plugged. I have had some growing pains with it, but none with the injection unit, all to do with the cheap aftermarket fuel pumps. I have replaced three of them. Luckily, none left me stranded away from home. I finally have the solution though. I bought a fuel pump from a 90's era Ford F150 which, from the factory, was designed to be mounted externally on the frame rail. 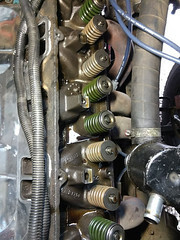 I also bought a package of the Ford quick disconnect fuel hose connectors and 20' of the new plastic fuel line and the matching Ford fuel filter. I opted for the top of the line Bosch pump, which I picked up for around $80. This is one of my projects to do along with the transmission swap once I get it inside in January. This will give me a fuel delivery system that is designed to work exactly how I am using it. It will also allow me to swap a component in minutes, anywhere. Every auto parts store across the country will have a pump in stock along with a fuel filter. Avoid the fuel pumps supplied with these FI systems at all costs. Just build your own with off the shelf Ford parts which will last many, many years. BTW, after doing the valve stem seals, my smoke issue at idle is gone. She used to smoke a bit at hot idle. Now there is no hint of smoke or oil burn smell from the exhaust. I highly suggest that if your motors are older like mine, do this project. It is really not that bad if you have an air compressor to pressurize the cylinder you are working on. Tons of YouTube videos of how to do it. All in all it took me a day to do the work. It idles smoother as well, no more vacuum leaks on the intake side. I love this old coach. Oh yeah? Why don't you marry it then??? Going back to my elementary school days..
That's why I was thinking the Holley Sniper. Originally, I was thinking about the Go EFI, which is a little cheaper, but the company hasn't been around nearly as long. It's a pretty safe bet Holley isn't going anywhere anytime soon. My rig currently has an aftermarket carb (Holley) on it that came with it, and I'm sure it needs to be rebuilt. It'll cost me 200 or so for that, and then time to hook it all back up and get it set right again. Or about 1200 or so to get EFI going. I'm leaning real hard toward the EFI, even though it costs 6 times as much. Does you kit control the distributor timing as well? Also, do you happen to have the part number for the front air bag kit you are using? Do your research, I have heard a LOT, And I mean a whole lot, of bad reviews and comments on the Holley system. Mostly pertaining to customer service and replacement parts and support of the system. On a custom system like this you HAVE to have good support. I have not done any research on the new crop of FI systems. Another one to consider is the FItech. But like Rick said, do the research. But to be quite honest, I have never had to call PP about mine. The system just works. Holly was if not the first, very close to the first in the business with bolt on EFI. Their original systems were really buggy, but they have improved a lot since then. I would hope their customer service is good. As far as the air bags go, they were a Firestone Ride Rite system that they no longer make. In fact, they do not even admit that they ever made it. Part of my Jan/Feb projects is to relocate the front air bags a bit farther outboard than the way it is designed. They come too close to the headers and I have melted two on the left side. When I get it apart I will get the bag numbers, I have to order a new one anyway, and take photos of the existing mounting brackets and my new or modified ones. It is not rocket science and I am sure anyone can come up with their own mounts, or design them and have a small fab shop weld up some. The bags themselves are still available. I also ordered 4 individual air control switches and 4 mini pressure guages. I am installing an on board air system and a control panel for the air bags in the above compartment above my drivers seat. It will be nice to be able to use the air bags for minor leveling when dry camping at WalMarts as to be able to tweak the pressures on the fly depending on road conditions. I will be taking photos of all that I am doing so if any of you want to copy it, have at it. Will probably do so. I'd like air ride; if I can't do air ride I'll do helper spings and rubber, but I think air would be better. Go air ride. The difference in handling is nothing short of amazing. No more body sway, wiggle, wag, and getting blown all over by passing semi's. Probably the single best improvement in ride over any other single upgrade I did to the suspension, followed by ditching the cheap Monroe shocks in favor of more expensive Bilsteins. You guys keep saying air ride, I am assuming you are talking about the air assist over the springs because converting to actual air ride would be very expensive! Here is the air ride on the rear of mine. Here is one of the ride height controllers. One of the air bags, This is on jack stands on the frame so I could get above the axle to get to the gas tank mounts. That is why the bag is all the way up like that. In all of the pictures they are blown up so I could get under it, in normal position the shiny area of the mount is where the bag rides. Here is the bag with weight on it but still pumped up above normal pressure. This RV has a Jetco leveling system where I can control the pressure in each bag so that when I am parked I can use them to level the coach. Yes Rick, I we are talking about the add on air bag "helper" springs. A true air ride like yours would be much better, but as you say, a very costly upgrade. I thought about designing a system, but it would be a lot of work to get it right. The Firestone system mounts between the leaf spring and frame. I think as the leaf springs age, they sag and loose some of their spring. These air bags help to get that back without pulling the spring stacks and having them re done. But, with the factory springs not working up to par, I think this helps us gain the benefit from the air bags. Air springs respond much smoother to the road, so letting them do their thing really helps the coach ride very good. I run very little pressure in mine to get the coach to ride really well. About 20 psi in the front and 40-50 in the rear. Air ride is nice but you do get a lot more roll from it than you do from leaves. You can see the sway bar in those pics, it is almost 2"!!! And then you also have a massive drag ling to keep the rear end centered which in my case needs new bushings, not something you pick up in the aftermarket. Are both your air bags on the same axle tied to the same circuit? If so, when your body wants to roll left, all the air from your left air bag just transfers to the right, doing nothing for the roll. If you can keep them independent, then you will get better roll control. That is a massive sway bar for sure. I wonder if they did that to compensate? Many aftermarket air bag systems tie them together to use one control to control the entire axle. I did not like this idea for the reason I mentioned above, so I keep each corner on it's own circuit. It works really well. I was looking all through that Kelderman page and their systems are a bit different than those I have installed in the past. Nowadays they have a steup that uses the factory springs and attaches the ends of the springs to the airbags. This still gives you a full air ride suspension without changing too much stuff under the truck. The old setups used to cut out just about everything under the frame and put in a new framework that cradled the rear and had the airbags back at the rear bumper. It was a nice setup and through leverage gave a very smooth ride but articulation was not the best. With this new setup articulation will be much better than stock. And for 1400 bucks for my Dodge dually that is not a bad deal! I already have an air compressor and tank for the helper bags that were on it when I bought it. Got me thinking! I bet if you call them and tell them what you have they could price out a system for you. See what happens when I get fixated on something? 1900.00 and you are ready to go with air ride suspension! That would go for about any of us. Well, except me since I have the Jet system. I think I would rather have this! I have seen this before!!!! Mike or Mark, do you remember a ways back someone was having trouble with a system that the bags were on an angle? It was on a tandem axle unit. THIS IS IT!! I remember it Rick. The owner was trying to re-engineer it to get the bags upright. This is definitely the setup that he had but it had extra parts on it like that big link that was being twisted sideways I kept asking about. Anyway, that is for another thread, I just wanted to verify that I did see it here and it was sort of the same with modifications to it.